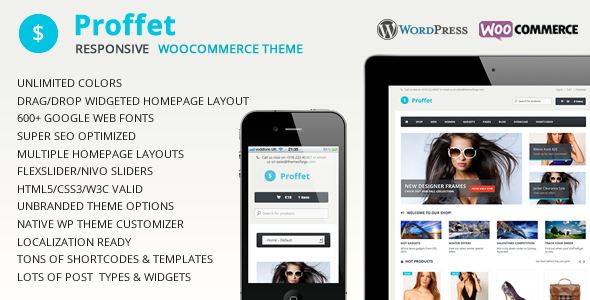 Proffet is a clean, ultra responsive WordPress eCommerce theme built specifically for WooCommerce. We’ve spent countless hours refining Proffet on both the iPad and iPhone to deliver a beautiful shopping experience. Key features like sliders, carousels and accordions have all been tested on tablets and phones aswell as the desktop to ensure no users are left behind. Your entire product catalogue will be displayed beautifully across all modern platforms. We’ve even created a few custom responsive WooCommerce widgets to make sure the experience is just right. Proffet has very detailed documentation to help you get setup in a matter of minutes with easy to use drag and drop widgets rather than countless theme options. SEO is incredibly important for any online store. We’ve extensively tested Proffet with the leading SEO plugins – in particular WordPress SEO by Yoast. 2 Homepage Layouts featuring Flexslider integration – proudly promote your best selling products. Fully widgetized Homepage layout – control your homepage with WordPress drag and drop widgets – with 14 widget areas you can completely customize your homepage layout without any coding skills. Responsive New and Featured Products Widgets – promote featured products via our custom responsive carousel widget. Touch enhanced nanoscroller to touch scroll through your latest products on the homepage. Unlimited color schemes using the new native WordPress Theme Customizer – color changes are made in real time! I provide free support 7 days a week for Proffet. I always aim to respond within 24 hours – and usually a lot quicker! I realise how important it is to have access to the theme author to answer any questions you may have. My other theme ratings are speaking for themselves. 5 Star support is part of the package! Hi Ed, Just bought this theme WOW!! its really just want I wanted!! If anyone is looking to buy this theme, you won’t be disappointed with its flexibility – functionality plus the support Ed provides really is top rate…. Really loving this theme so far, big thumbs up from me! Thanks for the great support so far with all of your themes. I really have had a great experience with your themes so far. brilliant theme!! The best out there! This is perfect theme! wonderful! Wow! This is a brilliant theme! And it works perfect! The following excellent images purchased via Photodune for preview purposes only.